Mathilde Flögl was a prolific and multi-disiplinary designer at the Wiener Werkstätte. Her experience as a graphic designer translated well for much of the surface design she executed in wallcoverings, glass, ceramics and textiles. She created ceramic figurines, assisted Josef Hoffmann with the ornamental elements in his metal work and interiors, and designed lace patterns and fashion accessories such as handbags and beaded sashes. She also compiled an important book celebrating the 25th anniversary of the Wiener Werkstätte, “Die Wiener Werkstätte, 1903-28. Moderne Kunstgewerbe und sein Weg. Festschrift zum zum 25 jähren Bestehen der Wiener Werkstätte.” Flögl oversaw the production of the album, although the idea of the book was Josef Hoffmann’s who wanted to create a record of the Wiener Werkstätte. MAK’s Wiener Werkstätte Archive has over 1,600 works by Flögl ranging from designs for textiles, posters, and decorative ornamentation to photographs showing her freehand drawings on glassware and decorative metalwork. 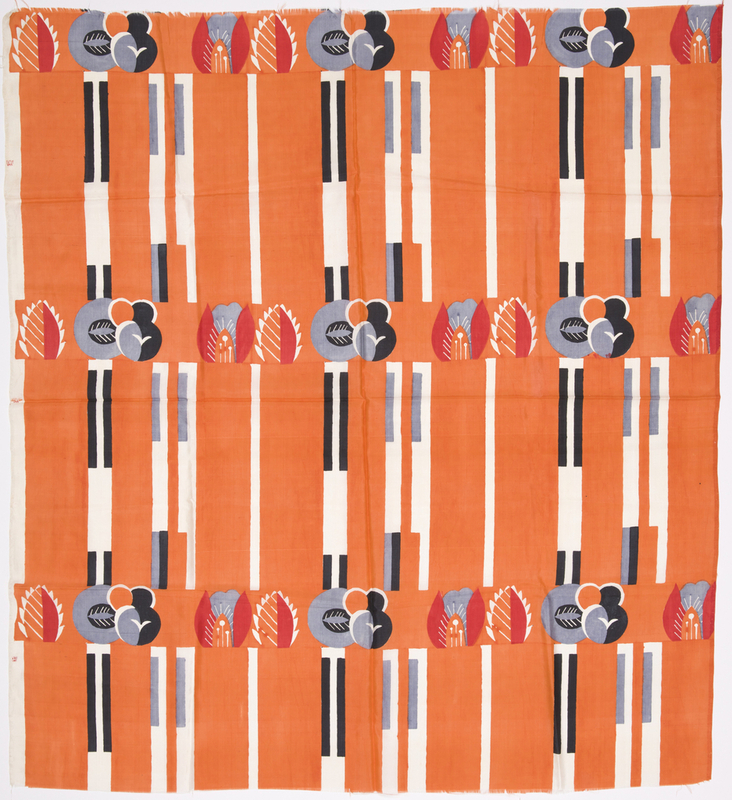 Like many of the designers at the Wiener Werkstätte, Flögl employed a variety of floral motifs in her work, which she often combined with geometric forms creating a hybrid pattern of the representational and abstract. Cannes is a perfect example of this type of pattern with horizontal bands of leaf-like forms and stylized flowers, which contrast with the vertical white stripes that have been partially infilled with black and gray stripes. The effect is rhythmical, effusive, and quite elegant, and one could imagine this silk used for fashion as well as the interior.